WE'RE BACK OPEN! COME ON BY! CHECK OUT THE NEWLY REMODELLED CLUB! AND HERE FOR THE SECOND FLOOR! 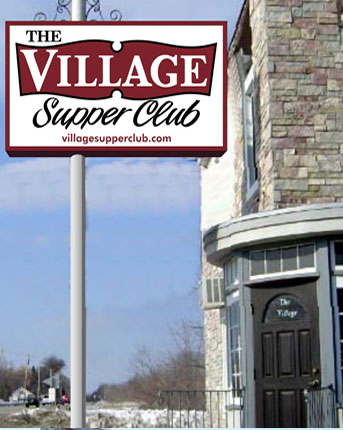 The Village Supper Club has been a family run business since 1927. Our family purchased the business in 2001 and in 2011 a fire destroyed our dining room and our upstairs living quarters. The only thing that survived in the dining room was the original bar. The 1st floor was rebuilt as closely as possible to the original décor. The entire back bar was destroyed but we were lucky enough to have it duplicated by the craftsmen of MCM cabinets. Everything looks the same but different because it is so new. The 2nd floor has been converted to a dining room with a fully stocked bar. We open the 2nd floor on Fridays and Saturdays. There is an entrance on the North side of the building with stairs and an elevator. Just ring the bell and one of the staff will assist with the elevator. Another way to get to the 2nd floor is from the 1st floor dining room, through the kitchen to the other entrance. People have always come into the kitchen to say hi, ask for a recipe, or comment on their meal. We are proud of our kitchen and everyone is welcome. Our menu has a lot of the old favorites, some new additions, and some new healthy items as well. The Saturday menu always has Prime Rib, Lobster, and Snow Crab in addition to specials. Specials are limited! 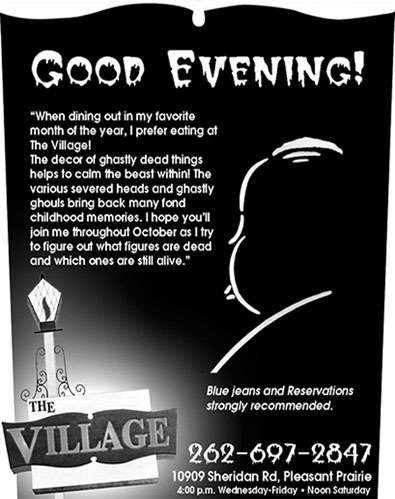 If the special entices you to make a reservation, please mention it when you call and we can reserve one for you. Our Village People link was created to quell rumors that we were a dangerous place to eat. You’ll see we are filled with just normal folks who like good food. We hope someday your picture will be added. Our Ad Archive is filled with goofy ads we have had fun making through the years. We’d love to know what you think of them. We’ll make more if you like them. We are still a small place even with twice the room so we recommend reservations on the weekends. You are also always welcome to eat at either of the bars. Hope to see you soon.